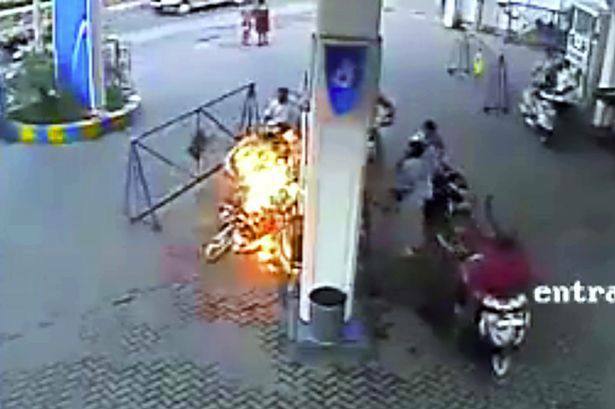 We have all read the signs and heard the stories about mobile phones causing fires at petrol stations - well does this video prove why? In the CCTV footage motorbike riders can be seen coming in and out of the forecourt with some stopping to fill up. About 10 seconds into the clip a biker flies in to the garage and goes to the opposite side of the pump from where the attendant is already filling up another tank. The biker, wearing a white shirt, can be seen reaching for his mobile phone as he sits on his bike waiting for the server. But as his bike starts to be filled, something causes a fire to erupt and set fire to the bike. Hyderabad City Police released the footage with a warning: "Don't use cell phones when you are at petrol pumps." But some of the police's Facebook friends have rubbished the force's claims. Guarav Jain said: "Dear Hyderabad Police, I really hope you use better sense when investigating real crimes than when posting warning videos. "Cell phones don't lead to fires. This is def a issue of fuel spill on what is a hot exposed engine." And Parveen Krishnan agrees:"Why does Hyderabad police think it's due to a cell phone when it's well established that this is a myth? "Cell phones do NOT cause accidents at gas stations. Never have. Not once."